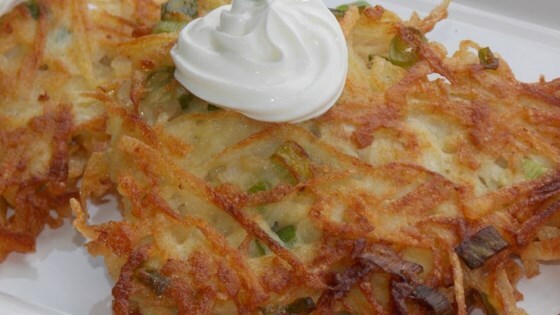 "We love these on Sunday mornings but have been known to have them for dinner. Serve with sour cream." Place shredded potatoes and apple in a clean kitchen towel. Gather towel on top and wring out excess liquid. Combine potatoes, apple, eggs, flour, and green onion in a bowl. Heat vegetable oil in a large heavy sauce pan over medium-high heat. Form mixture into palm-sized patties; fry in hot oil, working in batches, until golden brown, 2 to 4 minutes on each side. More oil may be needed with each batch. Remove pancakes from oil with a slotted spoon and drain on paper towel-lined plate. Sprinkle with salt. These were very awesome easy to make and very filling. We loved these! A nice little twist, with the grated apples! Will definitely make these again! Thank you, HeidiS! Yummy! My boyfriend said they were top notch! Simple, delicious...could easily make a meal out of these alone. Yum!